Agrimoney has reported that London wheat for January delivery hit £198.40 a tonne on Thursday, beating the previous record for a spot contract of £197.50 a tonne set in September 2007. The buying was reflected too in wheat prices in Paris, where the January contract touched a two-year high of E250.00 a tonne, a two-year high and a “big psychological level for many in the market”, according to a grains analyst Agrimoney spoke to. The market was finding that, despite the rises in prices of more than 80% in Paris since June, and more than 90% in London, “demand for wheat, and in particular milling quality wheat, has simply not been rationed”. And fundamentals both inside and outside the European Union “seem to offer little hope for a half to further price increases. On 20 December, Reuters had reported (this is via Futurespros) that Chicago wheat futures rose more than 1 percent on Monday, taking the monthly gains to around 18% as weather concerns in top exporters United States and Australia continued to underpin the market. The USDA (United States Department of Agriculture) Foreign Agricultural Service (FAS) has just released its August bulletin on world grain. It has made an effort to quell fears of a worldwide grain shortage by headlining the main report “No global shortage of food grains”, but the numbers provided indicate the reality at work. I have excerpted the important paras of the Grains report and the World Agricultural Production report. 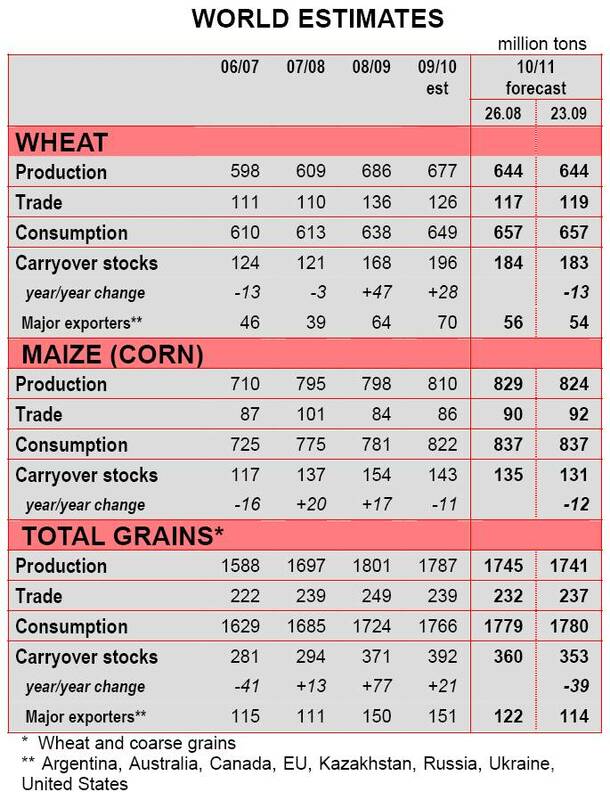 Also look at the table for wheat totals. 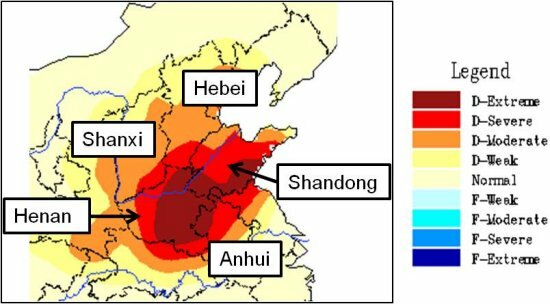 The July 2010 news and analysis on the global grain trade market have much to do with the weather conditions in Russia and Central Asia. 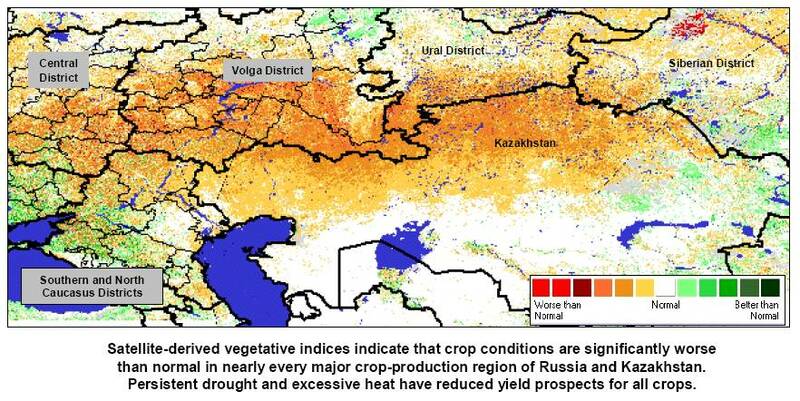 The Economic Research Service of the United States Department of Agriculture (USDA), the Food and Agriculture Organization (FAO) and the International Grains Council all concentrate on this region and the effect of an extraordinary heatwave on the wheat crops of Russia, Ukraine and Kazakhstan. 1) The Economic Research Service of the United States Department of Agriculture (USDA) said that the next decade is likely to see a major shift in global wheat production and trade. The largest gains in wheat production and exports will likely come from the region of the former Soviet Union (the one-time USSR), specifically Russia, Ukraine, and Kazakhstan, where changes in production efficiency and market forces combine to favor wheat. The USDA has projected that wheat exports by Russia, Ukraine, and Kazakhstan will increase by about 50% to over 50 million metric tons (mmt) by 2019. In the coming decade, the region may account for over half the growth in world wheat exports, perhaps even supplanting the U.S. as the “wheat breadbasket of the world”. The United States, the world’s largest wheat exporter since World War II, could slip to second place. US wheat production is projected to rise only slightly over the next decade, and exports are forecast to remain below the average for 2001-09. By 2019, according to USDA projections, Russia’s wheat exports will exceed those of the United States. And, total wheat exports from Russia, Ukraine, and Kazakhstan likely will be more than double those of the United States. The USA has been the largest wheat exporter during the post-World War II period. However, the US share of world wheat exports could drop from an average of 24% in 2001-09 to an estimated 16% by 2019, with the annual volume of US wheat exports declining from 27.5 mmt during the 2000s to 24.5 mmt in 2019. The European Union, Canada, and Argentina also will lose shares of world wheat exports, while Australia will likely maintain its share. USDA projects that over the next 10 years, Russia, Ukraine, and Kazakhstan’s share of wheat exports could increase from less than 20% in the 2000s to over 33% in 2019. Russia and Ukraine are returning to their historical role, as during the Russian tsarist empire which ended in the late 1910s, of being major wheat exporters. 2) The Food and Agriculture Organization (FAO) has said that the impact of unfavourable weather events on crops in recent weeks has led FAO to cut its global wheat production forecast for 2010 to 651 million tonnes, from 676 million tonnes reported in June. But despite production problems in some leading exporting countries, the world wheat market remains far more balanced than at the time of the world food crisis in 2007-08 and fears of a new global food crisis are not justified at this point, said FAO. A continuing, devastating drought afflicting crops in the Russian Federation, coupled with anticipated lower outputs in Kazakhstan and Ukraine have raised strong fears about the availability of world wheat supply in the 2010-11 marketing season. 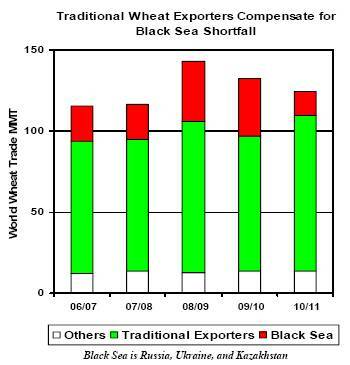 The turmoil in global wheat markets, which has intensified in recent weeks, is evidence of the growing dependence on the Black Sea region, an area renowned for erratic yields, as a major supplier of wheat to world markets. In addition, an expected production decline in Canada, another major producer and exporter of wheat, has reinforced market worries. International wheat prices have jumped by over 50% since June. This rapid increase in prices is prompting concerns about a repeat of the crisis of 2007-08. But after two consecutive years of record crops, world inventories have been replenished sufficiently to cover the current anticipated production shortfall. Even more importantly, stocks held by the traditional wheat exporters, the main buffer against unexpected events, remain ample. The latest downgrading of world wheat production forecast for 2010 points to a tighter supply situation and increases the likelihood of higher wheat prices compared to the previous season. 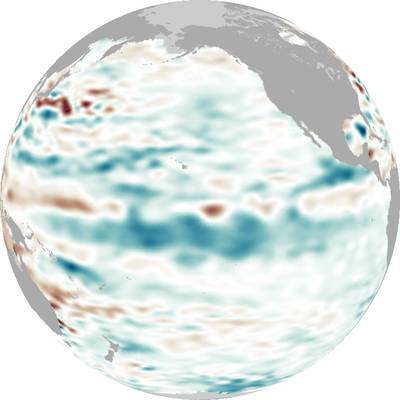 However, fears of a global food crisis are unwarranted at this stage. On the other hand, should the drought in the Russian Federation continue, it could pose problems for winter plantings in that country with potentially serious implications for world wheat supplies in 2011-12. 3) Heightened market concerns about the outcome of this year’s harvests in some key northern hemisphere exporters, especially wheat and barley in the Black Sea region, propelled prices of grains and oilseeds upwards in July, said the International Grains Council in its Grain Market Report of 29 July 2010. However, rice markets weakened further over the period. 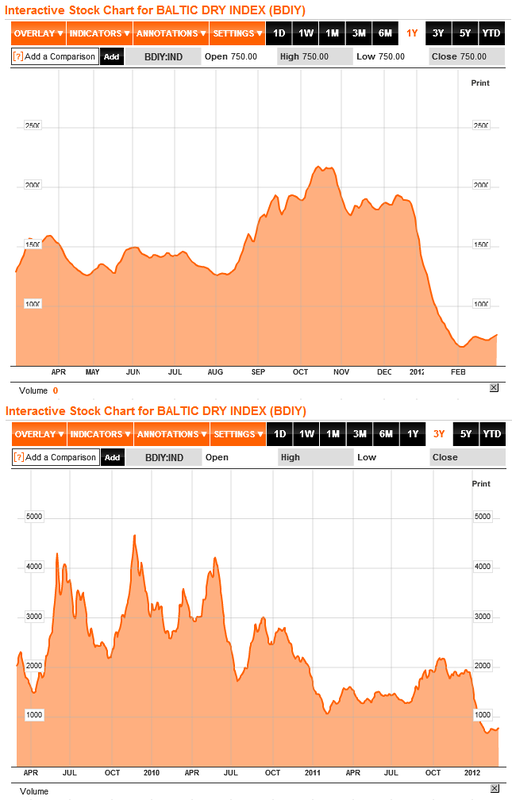 Milling wheat export quotations in the EU and the Black Sea region climbed by around US$70 per ton in response to reports of significant drought-induced yield losses in some areas, with markets also speculating about possible export restrictions in Russia and Ukraine. However, substantial new wheat sales were still being recorded from those countries. 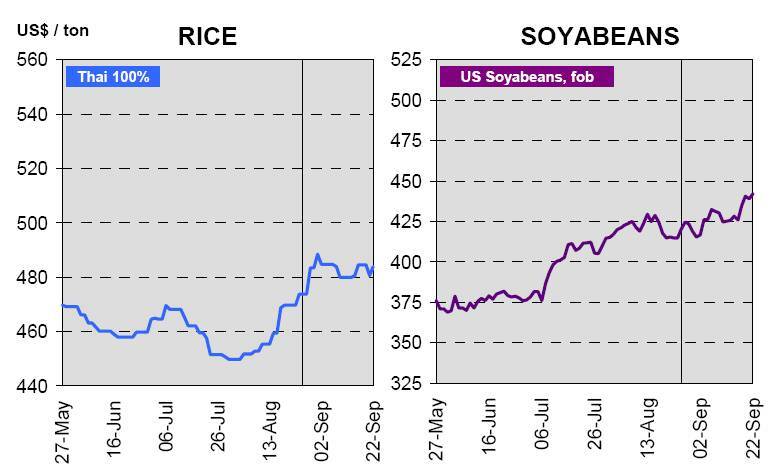 Wheat futures in the US reached their highest levels in over a year, with considerable speculative activity, but export values nevertheless became increasingly competitive against other origins, with this year’s ample availabilities likely to spur a sharp recovery in foreign sales. 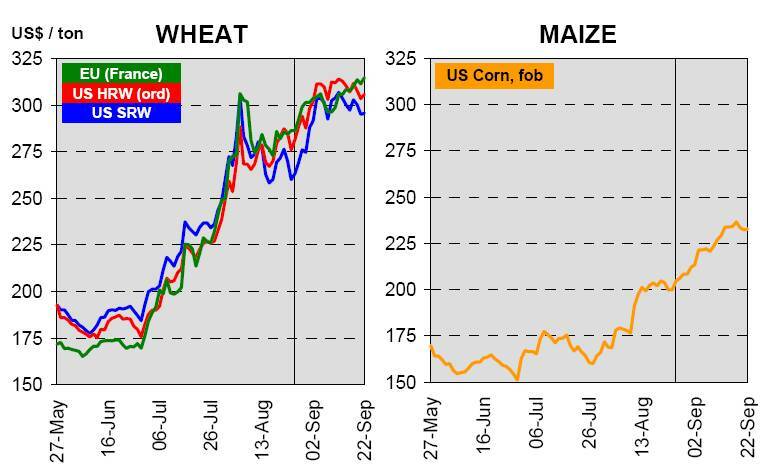 US maize futures, having initially slumped to nine-month lows at the end of June, climbed steeply in early July in response to somewhat reduced US supply forecasts and the rally in wheat, but the gains over the period as a whole were quite modest, reflecting the generally favourable crop outlook. For oilseeds, much of the focus was on diminishing US old crop supplies of soyabeans as the season neared its end and the continued fast pace of exports, especially to China. In contrast to the generally bullish tone of world wheat and coarse grains markets, international rice prices again moved lower in the absence of significant new buying in Far East Asia and the broadly favourable outlook for India’s next crop, although much depends on the final outcome of the summer monsoon. Ocean freight rates for grains and other dry bulk cargoes fell further in July although there were recent signs of increased chartering activity.